Although built on a smallish plot of land, this stylish and comfortable villa feels larger than it really is, due to its clever design. In fact, it’s possible to get lost as you make your way around its many rooms, courtyards and sitting areas. The living room is a great area for stretching out and relaxing, while still being able to keep an eye on the kids in the pool, although you may get distracted by those big baskets overflowing with magazines from all over the world. And if you do bring your kids, they are going to revel in having their own amazing bedroom/playroom with PlayStation and bunk beds, and their own terrace as an escape route. They are also going to get truly spoiled by the staff who will lavish them with attention. As for the food, it’s rare indeed to find a chef who knows how to cook the perfect over-easy egg, and this one is a gem who will continue to surprise and tempt you with tasty meals and afternoon snacks. The dining options are many, from formal to poolside – the barbeque courtyard beside the kitchen with its timber deck, pergola roof, stripy shadows and long picnic table was our favourite because, strangely enough, it reminded us of home. As spiritual souls with environmentally and community-aware leanings and a thirst for local culture, this one-of-a-kind villa has our name all over it. 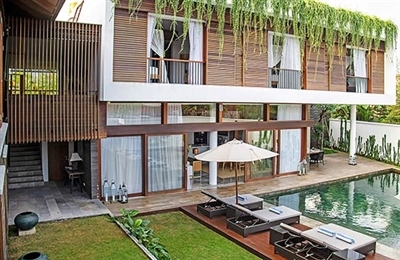 Villa Hansa (no coincidence it’s named after the Goddess of Knowledge) offers visitors so much more than just another Balinese deluxe villa (although the design is pretty gorgeous too). The devoted staff and ever-smiling manager sustain the Hansa philosophy when the owners are away. As the villa’s spiritual advisor, the manager is amazingly knowledgeable about Balinese culture and traditions, he was happy to divulge all over dinner and accompany us to a traditional Hindu ceremony in the local village. If you’re lucky enough to stay during a full or new moon (like we did), you also get a rare opportunity to watch Hindu priests bless the property. Staff, too, went out of their way to introduce us to daily Balinese life: teaching us how to make traditional palm leaf offerings and Indonesian delicacies in the kitchen – activities that the children really enjoyed. 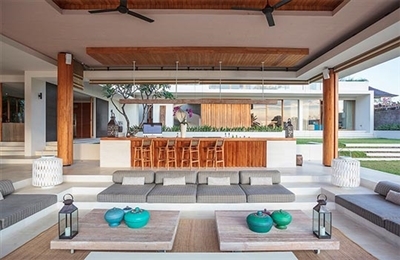 And it’s refreshing to find a villa where the owners are committed to eco-friendly practices, a healthy lifestyle and giving back to the community. These surfing and yoga devotees support local organic farmers, practice recycling in the kitchens and insist on biodegrable household cleaning. We also learnt about their wonderful trust fund, the Hansa Foundation, set-up to educate local children in traditional culture, arts, music and the environment. We thought that Villa Hansa would be ideal for groups of friends and for family groups spanning a wide age range – there are bedroom configurations here to suit all. Brand new at the time of our visit in March 2015, The Iman Villa was positively gleaming with its shiny new appliances and we had great fun with the electric blinds and discovering the joys of Apple TV. The flat white buildings reminded us of Greece, but instead of overlooking the Aegean, we were afloat in a sea of verdant rice fields. Low garden walls topped in pink bougainvillea make for an endless blue sky and views that go on forever. 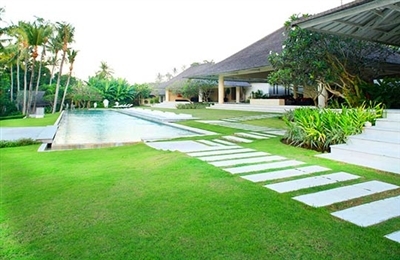 The gracefully terraced lawns mimic the adjacent rice fields and created the feeling of being very much a part of the natural environment, whether floating in the pool or lying on the bed of the master bedroom, looking through the spotless windows. We found the staff highly professional, wonderfully friendly and always happy for a chat, while meals were so fabulous that we wanted to kidnap the chef! With a background in fine dining restaurants and cruise ships, and a true love for the art of cooking, every meal exceeded our expectations. We didn’t try the Brazilian barbecue, but have no doubt that is excellent, and we feel utterly compelled to recommend the quesadillas, grilled red snapper and the sublime chocolate volcano cake. Finally, we loved the sense of getting away from it all, even though, in reality we weren’t really so far away at all. 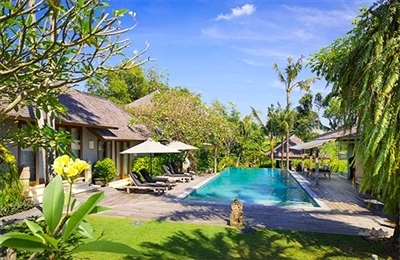 The villa has a stylish and neutral interior with authentic Balinese paintings and antiques adding a subtle shot of local character, while nonetheless staying true to its overall minimalist theme. The open-plan, ground floor living and dining room space was my personal favourite. The modern kitchen and large comfortable sofas make this a great area for hanging out and entertaining. As a wannabe barista I was particularly taken in by the Simonelli espresso machine – this really is the Rolls Royce of coffee makers. Simply ask one of the helpful butlers to make you a cuppa, sit back and experience the taste of coffee the way it was always intended to taste. Speaking of butlers, we were really impressed by the professionalism and friendliness of the staff throughout our stay. I’d particularly single out the chef who was more than happy to adapt to my partner’s vegan preferences, and villa manager, Made, who gave us some excellent insights into local Balinese culture. We even had the privilege of attending a small Balinese ceremony at the villa’s little shrine – a really unique ‘Bali experience’. The outdoor areas are great for lounging in the sun or cooling off in the 10-metre pool. Indrani’s courtyard garden is perhaps a little small given the size of the villa, but that didn’t really matter given how much time we spent on the beach. Most of the rooms overlook the pool and garden, which is ideal if you have young children to keep an eye on. We really enjoyed Indrani’s location so close to the beach. It’s also great for exploring the rest of Bali – especially as it’s an easy drive towards the glamour of Seminyak or the hipster vibes of Batu Bolong and Canggu. The beauty of this villa is the size, (and of course the views). Everything about it is huge and it is totally geared up for large groups of people, weddings and parties, with an extensive sound system (complete with hidden speakers that extend through the garden) and a highly professional kitchen with five-star cuisine prepared by two chefs. The U-shaped sofa in the living pavilion can accommodate 22 people, while the dormitory can accommodate 12 kids or, alternatively, the same number of adult guests who need to bunk down for the night. Note: although this room is not really suitable for adults, guests at events and weddings can sleep here for an additional fee. There were just two of us staying at Infinity, so we felt a bit lost lazing by the large pool all by ourselves. Still, it is a beautiful sprawling expanse of lawn and beautiful architecture so we got over that concern pretty quickly and got into the sheer amount of space available to us by imagining the stellar events that must take place here. An early morning swim is a must, especially as the pool is the warmest we have encountered. Mornings at Infinity are also a time of spectacular beauty with birds singing and crickets chirping; you can see the volcanic backbone of Bali on the horizon and watch the farmers out in their fields tending their crops. Just stunning!